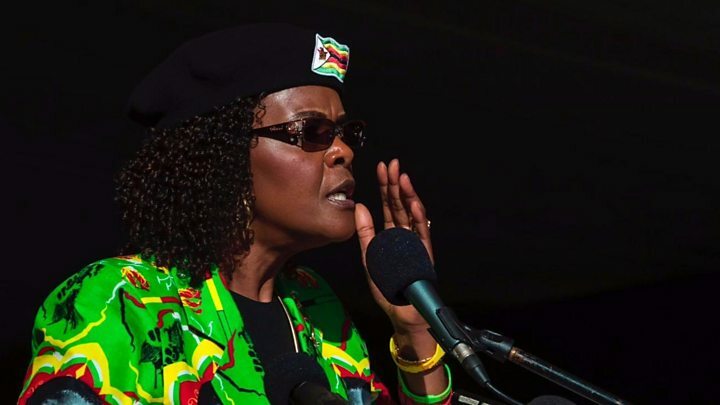 Zimbabwean First Lady Grace Mugabe has so far failed to appear in a South African court over an assault case despite officials saying she would do. South African police said in the late afternoon they did not know where Mrs Mugabe was. A 20-year-old South African woman has accused Mrs Mugabe of hitting her on the head with an extension cord during a confrontation at a hotel. 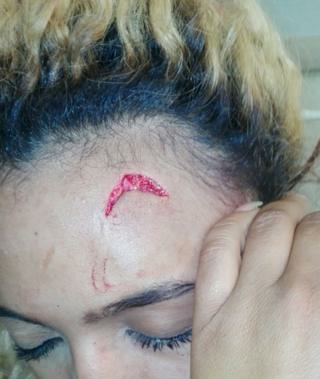 She released an image of a face injury online. Mrs Mugabe has not commented. Gabriella Engels accused Mrs Mugabe, 52, of hitting her after finding her with her two sons in a hotel room in Sandton, a plush suburb north of Johannesburg, the BBC's Pumza Fihlani reports. The attack is said to have happened on Sunday evening. "The negotiations over the suspect handing herself over have not concluded and our investigations have not finalised," police spokesman Vishnu Naidoo told AFP news agency. Police Minister Fikile Mbalula earlier said Mrs Mugabe had handed herself over to police but was not under arrest, and would appear in court early on Tuesday afternoon local time. Hours later Mr Naidoo clarified: "The minister learned later that it just didn't materalise as it was supposed to." In a phone interview for South Africa's News24 news site, she said she and a friend had been visiting the sons, Robert and Chatunga, at the Capital 20 West Hotel. A bodyguard asked her and her friend to wait in a separate room, after which the assault occurred, she said. "When Grace entered I had no idea who she was," she told News24. "She walked in with an extension cord and just started beating me with it. She flipped and just kept beating me with the plug. Over and over. I had no idea what was going on. I was surprised… I needed to crawl out of the room before I could run away. "Her ten bodyguards just stood there watching, no-one did anything, no-one tried to help me." In a statement, they confirmed that on Monday an unnamed 20-year-old South African woman had registered a "case of assault with intent to do grievous bodily harm". She was "allegedly assaulted by a prominent woman at a hotel in Sandton," they said, without naming Mrs Mugabe. Why was she in South Africa? She was due to be treated for an ankle injury, sustained during a road accident last month, according to Zimbabwean media. It is not clear whether she was travelling on a diplomatic or a normal passport. Mrs Mugabe is seen as a staunch defender of her husband, 93, and is the leader of the powerful women's league of Zimbabwe's governing Zanu-PF party. Zimbabwean Information Minister Christopher Mushowe told the BBC he was unaware of the allegations against her.